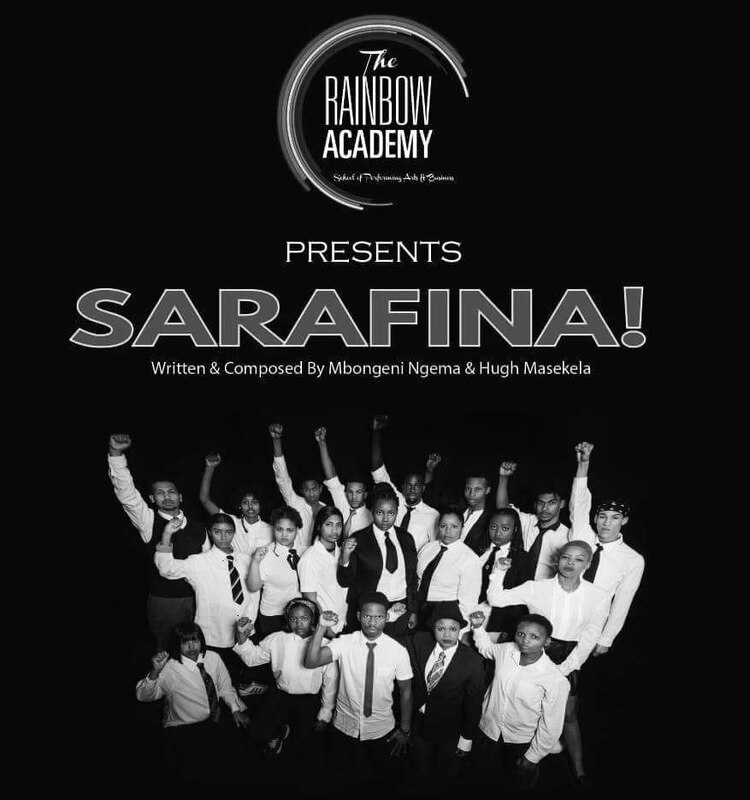 The Rainbow Academy Class of 2018 is proud to present the award winning South African hit musical SARAFINA! SARAFINA!, an ode to the lives of South Africa's fallen youth, who through their struggle, fought for equality in education during the 1976: Soweto youth uprising, is the ideal vehicle to showcase the immense talent amongst some of the best and brightest young people of today. The well-loved and iconic musical written and composed by legendary Dr Mbongeni Ngema with additional songs by the late struggle icon Hugh Masekela is given a fresh new life in this latest production that marks the school’s first official production at a public theatre. The youthful cast, made up of the Rainbow Academy graduating class of 2018, bring to the stage the full power and vibrance of the initial production that was designed especially for a young cast. Having young people who have lived through their own struggle for education brings a new poignancy to this production. The Rainbow Academy strives to educate empower and employ disadvantaged youth, and through their own personal struggles for education, the students show the importance of remembering our history, and to celebrate the youth and to empower them to strive for a better future. To that end, the proceeds from the ticket sales of all the shows will contribute towards the fees for the incoming Rainbow Academy students of 2019. The official Opening Night takes place on January 30th with daily matinees and evening performances through February 2nd. Schools across Cape Town are encouraged to attend the matinees of the 30th, 31st and 1st and can receive discounted group bookings. Schools can contact imke.dutoit@gmail.com for bookings. The Rainbow Academy is a nonprofit School of Performing Arts and Business with the aim of nurturing talent, educating young people, and addressing youth unemployment in the performing arts and creative industries. Imke Du Toit, Deputy Principal of The Rainbow Academy, and Director of SARAFINA! explains further, “The Academy has identified the untapped performance talent as the entry point to address youth unemployment and a programme has been created that mentors youth in a vibrant, relevant, creative and portable way. Our programme addresses history, culture, education, entertainment, tourism, entrepreneurship and jobs. Each beneficiary is mentored to make a very significant contribution to their own, others and community achievements in leadership and service. In South Africa, the educational opportunities for young individuals can be very challenging to come by especially for those few who come from within the disadvantaged communities." The Rainbow Academy provides a 1 to 2 year quality arts and business training programme with job placements for talented, disadvantaged youth with matric between the ages of 17-25. Each year 30 students complete a holistic programme of academic, practical and social growth that prepares them for a sustainable and planned career in the arts. Students are provided with practical training as well as academic qualifications in music in addition to short courses in business management, tourism and hospitality. The Rainbow Academy is targeting talented, disadvantaged youth who have completed their secondary education but have no access to further education or employment. There is a great demand for our programme in Cape Town. We plan to expand nationally to help bridge the gap between the current situation of unskilled, unemployed youth and a brighter, empowered future.